Throughout its history, the U.S. nuclear laboratory at Idaho Falls (presently known as the Idaho National Laboratory or “INL”) has been home to 52 nuclear reactors, the largest concentration of nuclear reactors in the world. Today, all but three reactors have been decommissioned, and employment levels at the lab have precipitously dropped over recent years. Nonetheless, the atomic laboratory at Idaho Falls has played a crucial role developing atomic technology across the United States. The Experimental Breeder Reactor (EBR-1): a pioneering scientific project which proved atomic energy could produce substantial amounts of electricity. Submarine Thermal Reactor (STR or S1W): a nuclear engine prototype designed U.S. submarine propulsion. The Idaho Chemical Processing Plant (ICPP or “Chem Plant”): tasked with the recovery and recycling of spent nuclear fuel. The Chem Plant extracted whatever U-235 might be left from a fuel cell after its use. It was also tasked with the management and disposal of nuclear waste. These early NRTS reactors laid the foundation for the laboratory’s identity and future endeavors to come. The promise of peaceful atomic uses juxtaposed against the determination for further military application became the dual defining characteristics of the new laboratory. The success of the EBR-1 reactor designed by Dr. Walter Zinn and his team proved that nuclear power could be harnessed to produce electricity. When the reactor went online for the first time on December 20th, 1951, it was the first time that the process of nuclear fission had ever led to electrical generation. Soon after, EBR-1 was producing enough electricity to power the complex in which it was housed. 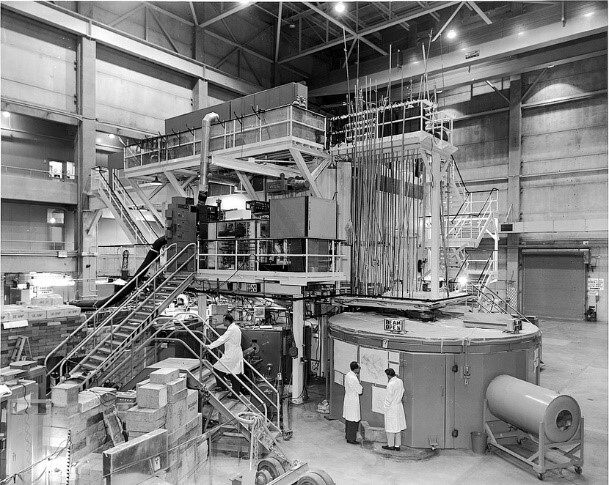 The reactor had the added benefit of turning previously unusable uranium-238 (a naturally occurring and plentiful isotope) into plutonium-239 (a synthetic isotope which could be used as reactor fuel). Despite its global abundance, the U-238 isotope is not fissionable. Since heat generated from fission is what drives electricity production in nuclear reactors, U-238 itself is useless, but the synthetic P-239 isotope can sustain fission. Transforming U-238 into P-239 expanded the fuel potential of the reactor immensely. Therefore, EBR-1 proved doubly useful in that it produced electricity while simultaneously processing the fuel needed to continue electrical generation. Despite its identity as a non-weapons related facility, the NRTS nonetheless became inextricably linked to military development. A prominent example is its crucial role in the designing and testing of nuclear propulsion prototypes in order to make nuclear-powered naval vessels a possibility. Argonne National Laboratory scientists teamed up with Westinghouse Corporation contractors to use the state-of-the-art equipment available at NRTS to devise and develop the proposed nuclear-powered engine at what would be known as the “S1W” reactor in Idaho Falls. The atomic engine’s dual zero-emission, zero-consumption feature provided a great competitive advantage to alternative forms of nautical propulsion. 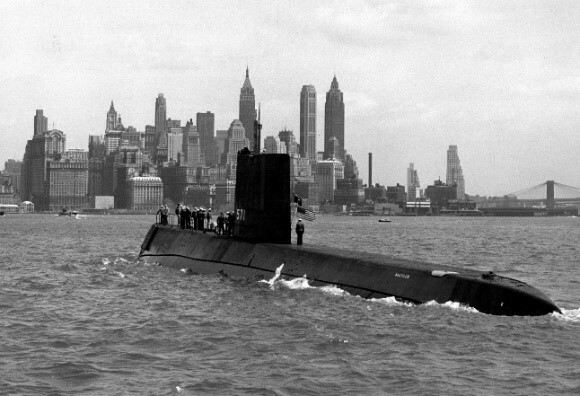 Five years after the reactor began operation, the U.S. Navy successfully launched the USS Nautilus—the first ever nuclear powered submarine—for deployment. The Nautilus could go farther and longer than any previous submarine due to its nuclear-powered propulsion engine. This innovation transformed the Navy’s potential reach throughout the globe. Naval students seeking to man these submarines trained in the Nuclear Power Training Unit at Idaho Falls up until 1995. Modern U.S. nuclear submarines and supercarriers owe their global reach in large part to the S1W experiments conducted in Idaho Falls. 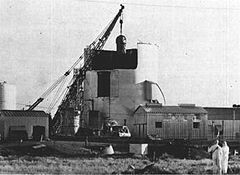 On January 3, 1961 a steam explosion and meltdown at an NRTS reactor named “SL-1” (short for Stationary Low-Power Reactor Number One) killed three Idaho Falls operators. It was the first reactor malfunction that resulted in fatalities at any atomic-related site since the AEC’s founding in 1947. Immediate concern that the explosion could result in radioactive contamination of nearby towns was soon alleviated, as health physicians and NRTS management officials measured negligibly low levels of radiation beyond the immediate site of the reactor. “The SL-1 accident was a big watershed point. Up until then, our detailed procedures weren’t much, but we were able to get a lot done in a short amount of time. After SL-1, the reactor was shut down, and we had many, many reviews of procedures. Some reactors at the Site went two years before starting up again. There were committees, and everyone was reviewing procedures and developing formalized sign-offs. It turned into a totally new way of doing business with reactors” (Stacy, 2000). The reactions of surrounding towns, though, were quite minimal. 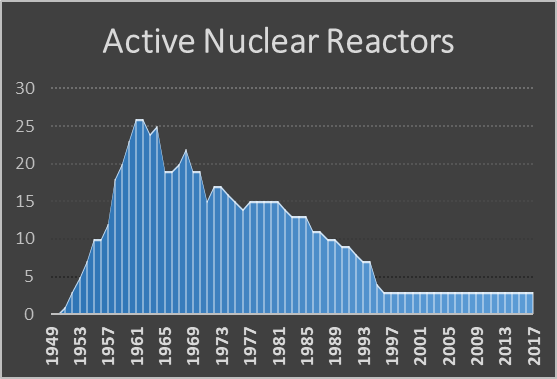 In the short term, public acceptance of nuclear power went largely unchanged despite the unprecedented nature of this event. An estimated 790 people were eventually exposed to harmful doses of radiation throughout the explosion and subsequent cleanup (Maslin, 1984), but local residents did not seem to muster any considerable alarm that the laboratory posed a threat to their safety. As criticism of nuclear power become more widespread in the late 1970s and early 1980s, the SL-1 incident came under increased public scrutiny. As public support for nuclear power waned, the incident became one example to which protesters referred in order to argue that nuclear power posed a threat to public safety and that the exploration of its potential uses must be curbed. As reactor continued to generate electricity at the Idaho laboratory, spent nuclear materials continued to accrue but with no clear plan for long-term removal. The 1970s and 1980s passed without any radioactive waste removed from the site at all. In fact, nuclear sites across the country were transporting their hazardous waste to the Idaho laboratory for “interim” storage until a permanent location could be decided upon. Fears abounded that the Snake River Aquifer—an underground source of drinking water for some 300,000 Idaho residents which sat directly below the laboratory—could be contaminated if hazardous waste continued to be stored on-site. By the early 1990s, the Cold War had come to an unexpectedly abrupt end, and nuclear energy had fallen out of favor with the general public. Before a joint session of congress, President Bill Clinton stated: “We are eliminating programs that are no longer needed, such as nuclear power research and development.” Nuclear energy, it seemed, was an undesirable remnant of the now-concluded Cold War. The continued buildup of nuclear waste, the potential health risks to the aquifer, and the collapse of the Soviet Union—all these corresponding events—worked to roll back financial support and public acceptance of the projects at the Idaho Falls laboratory. At its founding in 1949, the economic benefits of the laboratory made Idaho Falls the envy of Western states, but as the 20th century neared its end, the environmental consequences of the site drew substantially more notice by the state and federal government. The conflict culminated in a lawsuit filed by the State of Idaho in 1995 to block further interstate waste transfer into the Idaho laboratory. The state reached an agreement with the “federal parties” (Department of Energy and the Navy) which laid out a road map for scaling back waste transportation and removing on-site waste over the long-term. The state agreed to the continued transfer of up to 1135 shipments of waste over a 40-year period, provided that by the year 2035 all spent nuclear waste would be removed from the state. Should the federal parties fail to remove all waste by this date, the state then has the authority to enact fines of up to $60,000 each day the terms of the agreement are violated. This agreement was a turning point for the identity of the laboratory. The main efforts of the laboratory shifted away from solely nuclear innovation toward environmental rehabilitation and other non-nuclear related research. As employee Brad Bugger put it: “I started working here as the Cold War came to an end. And a lot of the traditional missions that were done here […] were going away. So by the mid-nineties, 1995… when the Settlement Agreement was signed, we were sort of casting about for a mission for the site” (Swanson, 2012). Nuclear research still continued at the Idaho laboratory, but beginning with the 1995 Settlement Agreement, government and public attention concentrated on minimizing, preventing, and eliminating risks of the site. At its peak in the early 1960s, the laboratory was home to 26 active reactors, but since 1996 three reactors have remained online. In 1999, nuclear waste finally began to be transferred away from the laboratory to the Waste Isolation Pilot Plant (WIPP) in New Mexico. Research initiatives broadened to include non-nuclear projects—related mostly to homeland security and environmental sustainability. In 2016, the Department of Energy awarded Fluor Idaho, LLC, a $1.4 billion contract for the continued environmental rehabilitation of the site outlined by the Idaho Clean-up Project (ICP). It will be the responsibility of Fluor to ensure “the safe environmental remediation of the Idaho site, including dispositioning transuranic waste, spent nuclear fuel storage and high-level radioactive waste processing.” Stakeholders hope that by the end of this contract, all transuranic waste will be removed from the Idaho laboratory site and that hazardous materials buried in the site’s Subsurface Disposal Area will be exhumed for future transfer.